Mia Strudley winning her 800m heat at the Box Hill Classic. It was another big week for Yarra Ranges Athletics athletes as they prepare for upcoming championship events. 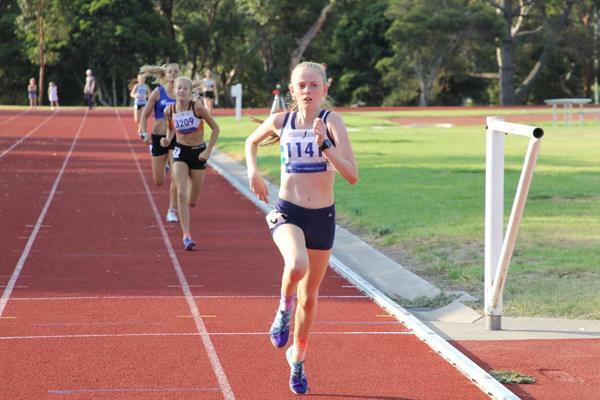 Fourteen club athletes competed at the Box Hill Classic on Thursday night. Ideal conditions presented the opportunity to run some fast times in the 200, 800 and 3000m events on offer. Saturday morning, Yarra Ranges Little Athletics members chased personal bests a week out from the EMR Region championships. The weather gods turned up an hour early and ended the morning prematurely. But the PB bell was ringing non-stop for a while beforehand. Saturday afternoon, in slightly calmer weather, the Yarra Ranges Athletics senior teams competed in round 12 of AV shield. The final round of the shield season presented the final opportunity to push for spots in the finals. Yarra Ranges qualified four teams for the final to be held at Lakeside Stadium on Saturday 23 February – the Men’s Open, Men’s Under-18, Women’s Open and Women’s Under-14. The club passed on its best wishes and a speedy recovery to Ashleigh Rooke after she injured her shoulder at training last week.